A substantial five bedroom detached family home which is arranged over three floors in the popular and sought after village of Little Canfield. The tastefully decorated accommodation is complimented with two reception rooms to the ground floor, a large size kitchen/breakfast room with utility room and ground floor cloakroom. 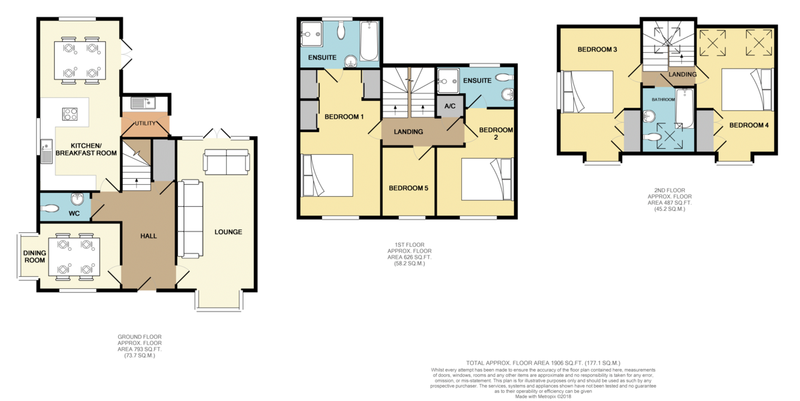 The first floor has two en suite bedrooms and a further bedroom. The top floor boasts two double bedrooms and family bathroom. The exterior of the property benefits from an enclosed rear garden, which has been artificial lawn and BBQ area along with substantial patio area. There is also a detached double garage with driveway for two vehicles, which is located adjacent to the house. The property is within a short walk from the local shops, parks, nursery and primary schools and the location is on one of the quieter roads in Little Canfield, where no parking issues arise. Entrance Hall: Radiator, stairs to first floor landing, storage cupboard, door to front aspect, tiles throughout. Cloakroom: Low level WC, pedestal wash hand basin with mixer tap, extractor fan, part tiled walls, radiator, integrated shoe storage and tiled flooring. Dining Room: 13`5 x 8'10 Feature double glazed box bay window to side aspect, double glazed window to front aspect, radiator. Lounge: 22'2 x 10'5 Double glazed French doors to rear aspect, double glazed box bay window to the front aspect, radiators, fireplace with surround. Kitchen/Breakfast Room: 22`4 x 10`9 Double glazed windows to the rear and side aspects, a range of matching wall and base units with worktops and inset one and a quarter stainless steel sink with drainer and mixer tap, fitted water softener with drinking water tap, integrated five ring gas hob with canopy style extractor over, integrated fridge freezer, dishwasher, eye level double oven, radiators. Utility Room: 6`2 x 5`7 Matching wall and base units with worktop, wall mounted boiler in cupboard housing, Spaces for washing machine and tumble dryer, double glazed door to side aspect, radiator, tiles throughout. First floor landing: Stairs to ground and second floors, radiator, airing cupboard. Bedroom One: 19'4 x 10'9 Double glazed window to front aspect, radiators, three fitted wardrobes with mirror fronted sliding doors. En-suite: Double glazed obscured window to rear aspect, suite comprising, double width shower cubicle, low level WC, pedestal wash hand basin mixer tap, panel bath with mixer tap and shower attachment, part tiled walls, radiator and extractor. Bedroom Two: 14'3 x 10'9 Double glazed window to front aspect, radiator. En-suite: Double glazed obscured window to rear aspect, enclosed shower cubicle, low level WC, pedestal wash hand basin with mixer tap, part tiled walls, radiator and extractor. Bedroom five: 9'4 x 7'0 Double glazed window to front aspect, radiator. Second floor landing: Double glazed Velux to rear aspect, access part boarded loft, stairs to first floor landing, radiator. Bedroom Three: 17'8 x 10'11 Double glazed windows to front and side aspects, fitted wardrobes and storage, radiators. Bedroom Four: 17'9 x 10'8 Double glazed window to front aspect, double glazed Velux to rear aspect, fitted wardrobes and storage, radiator. Bathroom: Double glazed Velux to front aspect, a white suite comprises a bath with mixer/shower attachment, pedestal wash hand basin with mixer tap and low level WC. Part tiled walls, chrome radiator, extractor. Outside: The rear garden commences with patio, the remainder is laid to artificial lawn with mature shrub boarders. A personal door leads to double garage, outside tap, side access gate with further outside tap. Detached Double Garage: 19'5 x 19'5 Two up and over doors, power and lighting connected, door to garden. Driveway parking in front of garage.